The Cedar Creek Falls is situated just about thirty minutes away from the Airlie Beach and the way up to the waterfall would give you the chance to enjoy the stunning landscape, cane fields, the secluded natural waterhole and much more. The waterfall itself is a picturesque little spot which is ideal for swimming or for a nice little picnic. This truly Australian experience is unique, and you are sure to love it. Explore the waterfall, swim in the refreshing pool that consists of crystal clear water, get the chance to view a variety of wildlife including turtles, butterflies, lizards, birds, fishes and much more and have fun. Also, the best time to visit would be just after the rainy season when the waterfall surges the best. Tips & Warnings: There is a parking area only 100 meters away. Insect repellent is a must as mosquitoes are rampant. How popular is Cedar Creek Falls? 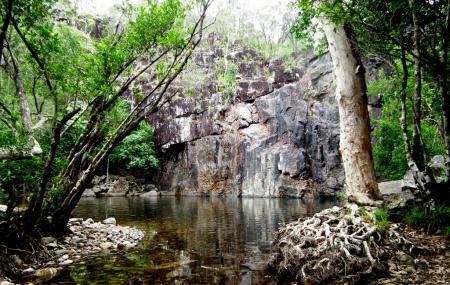 People normally club together Conway National Park and Big 4 Adventure Whitsunday Resort while planning their visit to Cedar Creek Falls.